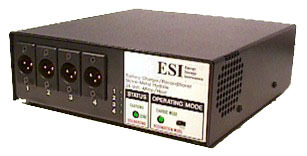 The 100 Watt four channel battery charger utilizes a charge section with a multi-input connection system designed to sequentially charge up to four of the same type of battery. It also contains a high power discharge circuit and cooling fan for reconditioning nickel cadmium and nickel metal hydride batteries. This unit is available with software specifically for the professional video camera industry with battery voltages ranging from 12.0 to 14.4 Volts and up to 10 Amp hour in size. The recondition feature is very effective in the professional video and film industries due to the high battery cutoff voltages common to many professional video cameras. The recondition feature greatly improves the performance and lifetime of these batteries. Operating Temperature Recommended 0 to 30 degrees Celsius. 50 degrees max.